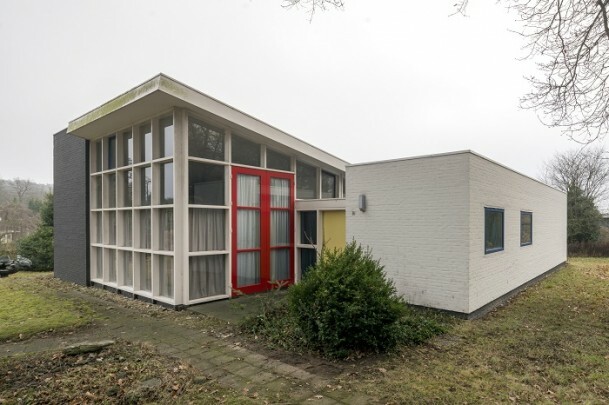 Next door to the Stoop residence is the studio house designed for the artist Piet Slegers (1923-2016). It combines a raked volume of living room and studio, presided over by a large expanse of glass in the north, and a less-tall volume containing bedrooms. The many upper lights make the fairly small house seem spacious inside. Its brick frontage is painted white or black, the wooden frames white and doors and window frames red, blue, yellow and black. Designed to a module of 1 metre, the house is now the property of the Hendrick de Keyser Historic Houses Association.